I’m working on starting my own website. I’ve had the domain name popwheel.com for years now and used to have a portfolio of my artwork on it years ago when I was still in Art School but in recent years other things became priority and I no longer had time to maintain it. So I’m excited that my artwork will soon have a permanent home on the Internet! All day Saturday, I was rushing around cleaning–so I don’t really have any new artwork to show tonight. I’m feeling the “Sunday night dread” of having to go back to work in the morning. I come from a family of entrepreneurs and independent workers, I’m actually the only person in my family to take the route of the corporate lifestyle. So the lifestyle and mentality of being self-employed is familiar to me. More and more I’m feeling like it would be nice to be an at-home worker and do my art thing full time. I’d be very interested in comments from any of you who are currently working full-time as artists and how you knew when it was time to make that big leap. This is a picture of my office. 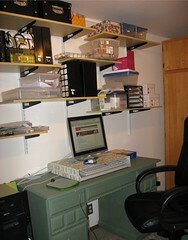 I usually work in here on digital art projects if I want to be secluded from other things going on around the house. This room is in my basement just off the living room, so I can still see the TV or put on a movie. I like this room because it has 2 giant clothing armoires that were left by the previous owners. They have drawers at the bottom that work perfectly as flat files for paper and artwork. This will work well until I can buy a regular flat-file cabinet for artwork storage. I also like the wall of shelving. It preserves floor space and everything is in easy reach when I want it. Plus, it’s an opportunity to buy pretty storage containers to put everything in. My cat Salem, loves it when I work at this desk because he curls up in my lap in this big comfy chair. This entry was posted on March 5, 2007 at 12:27 am	and is filed under about me, Work Life. You can follow any responses to this entry through the RSS 2.0 feed. You can leave a response, or trackback from your own site.